Adriana Esteves is a Brazilian actress and former model. 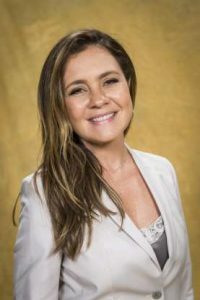 She is best known for her roles as Dalva de Oliveira in the miniseries, Dalva e Herivelto: uma Canção de Amor, and as Fátima Libéria do Nascimento in the 2016 Brazilian miniseries Justiça. For her work in Dalva e Herivelto: uma Canção de Amor, she was nominated for an International Emmy Award for best actress in a dramatic series in 2011, and in 2017, she was nominated by the second made International Emmy Awards in the category Best Actress for Justiça. Esteves has also appeared in such films as Tiradentes, Minions, and Benzinho. Born Adriana Esteves Agostinho on December 15, 1969 in Rio de Janeiro, Brazil, to Regina Esteves Agostinho and Paulo Felipe Agostinho, she has two sisters, Cláudia and Márcia. She worked as a model before she got her start on TV on the series Domingao do Faustao. Esteves’s first television appearance was as an extra on the soap opera Vale Tudo. She has been married to Vladimir Brichta since 2006. She was previously married to Totila Jordan Neto from 1988 to 1990 and Marco Ricca from 1994 to 2004. She has two children: Felipe and Vicente. *She was born in Rio de Janeiro, Brazil on December 15, 1969. *Her mother is a plastic artist, and her father is a doctor. *She modeled before she started her acting career. *For her performance in the miniseries Dalva e Herivelto: Uma Cancao de Amor, she was nominated for an International Emmy Award.